Dr. Jiwen Fan, atmospheric scientist at Pacific Northwest National Laboratory, led research that linked heavy air pollution to devastating floods in China. The ground-breaking work caught the attention of the journals Science and Nature, and both published new articles about the research. The British Broadcasting Company (BBC) World Service also covered the research for their Science in Action Series. 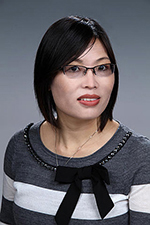 Fan, colleagues from PNNL, and her collaborators from The Hebrew University of Jerusalem and the University of Maryland, conducted modeling studies on the devastating 2013 Sichuan flood in China to find the connection to pollution. The complete study is published in the early online edition of Geophysical Research Letters. Fan's research covers atmospheric chemistry and aerosol formation, to cloud and convection studies. She is a well-recognized expert in the field of aerosol-cloud-precipitation interactions and a winner of 2015 American Geophysical Union's ASCENT award. She received a Ph.D. in atmospheric sciences from Texas A&M in 2007 and joined PNNL as an atmospheric researcher that same year. Read the Science news article: "Catastrophic Chinese floods triggered by air pollution"
Read Nature news highlight: "Air pollution triggers floods"
Read about the research led by PNNL: "Air Pollution Amplified Extreme Weather, Floods in China"